Nosebleeds, also called epistaxis, have a variety of causes and occur more often in children under the age of 16. In most cases, nosebleeds are caused by minor trauma and stop bleeding within minutes, especially if ice is applied or the bridge of the nose is pinched. Vitamin deficiency nosebleeds in children and adults are more difficult to stop. Nosebleeds may also be a symptom of a serious medical condition, especially if they are frequent and bleed for more than 20 minutes, so consultation with a health professional should be considered. The blood vessels of the nose are relatively fragile and easily rupture with nasal trauma, either from a physical blow or from forcefully blowing the nose. 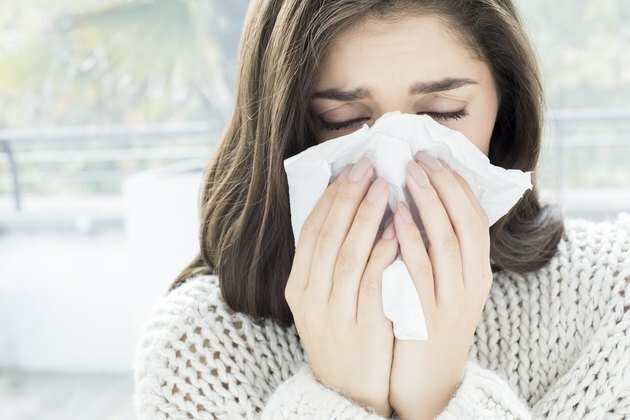 They can also be a result of mucosal dryness and inflammation, aggressive nose picking that damages the mucosal linings or epithelium, a benign growth at the back of the nose or a blood-clotting disorder. A lack of certain vitamins, especially K and C, can contribute to the mechanisms of nosebleeds. Vitamin K is required as a cofactor for an enzyme that catalyzes glutamic acid into gamma-carboxyglutamic acid, which is necessary for coagulation to occur. Coagulation is the process of stopping the flow of blood by clot formation, which is critical to heal damaged blood vessels. Vitamin K deficiency leads to uncontrollable bleeding once a blood vessel is ruptured. Trauma to the nose easily damages its small arteries and, without adequate levels of vitamin K, the nose loses more blood than it normally would. Other signs of vitamin K deficiency include easily bruised skin and muscles, bleeding gums and blood in the urine and stool. Vitamin C is necessary for the development of normal collagen, which is the main component in connective tissue. Collagen resides within skin and blood vessels. A deficiency of vitamin C weakens blood vessels, which can lead to a condition called fragile capillaries. The fragile vessels and capillaries of the nose are especially reliant on healthy collagen to prevent rupture and leakage. Severe vitamin C deficiency, known as scurvy, commonly leads to easily provoked bleeding from the nose and gums, as well as bruising of the skin and muscles, according to the University of Maryland Medical Center. Severe vitamin C deficiency is extremely rare in Western countries, although marginal deficiencies do occur in people who do not eat fresh fruit and vegetables. Deficiencies of vitamins B-9 and B-12 could lead to increase risks of nosebleeds because they lead to elevated levels of homocysteine in the blood, which damages the walls of blood vessels and makes them more susceptible to aneurysms and ruptures. Vitamin A is needed to keep the mucosal membranes of the nose, sinuses, mouth, eyes and digestive tract moist and healthy. A deficiency can lead to dryness and inflammation in the nasal cavity, leaving it more susceptible to injury and bleeding. Dry mucus membranes also increase the risk of infection, which can also cause bleeding from the nose. Orange and yellow vegetables and fruit are good sources of vitamin A, according to the University of Maryland Medical Center.